Plans for Another 22,812 Wells in Colorado Alone! To understand what is happening here, we need to look at the larger context of Lexam’s “drillplay.” There is currently a “land rush” by oil and gas companies on federal lands in the Rocky Mountain region that has been going on ever since President George W. Bush signed Exective Order 13212 in 2001. The horrific scope of this “land grab” and the determined and heroic efforts of local citizens to protect their homes and landscapes is portrayed in the excellent video, “A Land Out of Time” (www.alandoutoftime.com). Although federal law mandates that federal lands should serve “multiple uses”, a series of decisions and rulings of the Bush administration has given gas and oil drillers the priority and dominant use of our public lands. The Wilderness Society Executive Summary notes that there are some places where it is appropriate to drill, if done at the right pace and with appropriate practices. However, there are currently 36 million acres of public lands under lease for oil and gas development and over 63,000 producing oil and gas wells on public lands. The Wilderness Society’s BLM Action Center concludes that the government plans to double this number to over 118,730 producing wells within the next 15 to 20 years, mainly in the Rocky Mountain states of Colorado, Wyoming, Montana, New Mexico, and Utah. According to this study, there are PLANS FOR ANOTHER 22,802 WELLS IN COLORADO ALONE! Oil and gas is the single richest industry in the world, worth over $1 trillion/year. Over 2 million oil and gas wells have been drilled in the U.S. As of 2002, there were a total of about 520,000 producing oil wells and 360,000 producing gas wells here. That number is expected to double by 2012. The San Juan Basin of New Mexico has over 18,000 wells, with the Bureau of Land Management (BLM) proposing an additional 12,500 wells in just one portion of the Basin. By some estimates, at least half of the natural gas that can be produced in the U.S. has already been burned. Because consumption has outpaced production, the nation now imports over 15% of the natural gas it uses. As supplies dwindle and demand soars, prices have also soared; natural gas prices skyrocketed 400% in the year 2000 alone (the year that ENRON made a killing by creating artificial gas shortages in California (see the excellent movie: ENRON: The Smartest Guys in the Room for an inside glimpse of how corporate greed and criminality can run amok, www.magpictures.com). The federal government is now providing huge subsidies to the gas extraction industry. However, natural gas, this supposedly cheap, abundant, and “clean” fuel of choice, has become extremely expensive both in terms of dollars and damage to communities and to the environment. We are now reaping the consequences of a failed and corrupt national energy policy which places greater priority on corporate profit-taking than on the well-being of the citizens and land that government is supposed to protect. Along with the boom in gas and oil, comes a vast grid of associated infrastructure: wells, well pads, roads, power line and pipeline corridors, waste water impoundments, evaporation ponds, compressor stations, processing plants, and other facilities. This development is now adversely affecting public and private lands, water resources, crops and soils, air quality, and property values. The impacts on people, communities, and the environment are often dismissed as “collateral damage” by the present administration as well as by the federal and state regulatory agencies involved in the permitting process (Kuipers and Associates, 2005). As a matter of fairness, when an oil or gas company’s actions result in expensive damages to land, water supplies, and other natural resources, the burden of cleanup should be born by the company, not taxpayers or landowners. However, companies typically cut corners in the exploration, production, and cleanup phases of their operations in order to maximize their profits by “externalizing” their losses, i.e., letting the taxpayers pay to clean up the mess they leave behind. Peggy Utesch of the Grand Valley Citizen’s Alliance notes that, generally speaking, citizen groups can’t hope to sue oil and gas companies because all the laws are in their favor, based on over 100 years of legal precedents. In fact, we are dealing with an entrenched system of state-supported monopoly cartels that goes back to the beginning of the oil industry, when John D. Rockefeller gained control of 90% of the oil industry by 1880 (Wasserman, 1994). When the state uses its power to protect the interests of private profiteers over those of its citizens, the form of government shifts from that of democracy to that of corpocracy, i.e., fascism. On May 18, 2001, former oil-man and President George W. Bush signed Executive Order 13212 (Actions to Expedite Energy Related Projects) which ordered all government agencies to “expedite” new oil, gas, and coal projects. At the same time, the Bush administration drastically cut funding to federal agencies and regulatory agencies, so they are now too short-staffed and under-funded to enforce the existing laws that regulate industry and protect communities and the environment. Peggy Utresch of GVCA notes that a study showed that 90% of the changes local people wanted to see regarding the oil and gas industry were already in the existing rules and laws, but these laws were not currently being enforced. For example, typically, federal agencies now pull people off of inspection duties so they can concentrate on issuing more oil and gas permits. And due to lack of staff, it is physically impossible for regulatory agencies to do the amount of inspecting that is needed and required. The Colorado Oil and Natural Gas Conservation Commission (COGCC) is issuing the highest number of new permits for oil and gas wells ever- 5400 in 2006 vs. 2917 in 2004. Colorado now has about 30,000 active wells and another 40,000 that have been plugged and abandoned. 2) Lexam’s management team, headed by Canadian Rob McEwen, former CEO (and current largest shareholder) of Canada’s Goldcorp Inc. and now head of U.S. Gold, oversaw development of Red Lake Mine, Canada’s largest and richest gold mine. 3) Lexam purchased 50% of the hard mineral rights from Baca Minerals in 1987 and the other 50% of the oil and gas rights on the Luis Maria Baca Grant No. 4 from Newhall Land and Farming Company for $1 million. It acquired the additional 25% of the oil and gas rights from the Baca Corporation (Fallaron) in 1996 from Gary Boyce for $1 million. Lexam also owns various interests in varying percentages of the hard mineral and oil and gas rights on land to the north and west of the new Baca National Wildlife Refuge (BNWR). The remaining 25% of oil and gas rights on the property is owned by ConocoPhillips, which is now drilling on the Arctic National Wildlife Refuge (ANWAR). 4) Lexam acquired surface access and use by ‘fee simple ownership’ and a Surface Use Agreement with American Water Development, Inc. (AWDI) in 1992 for $1 million. This agreement is a 20-year paid-up lease that is binding on surface owners who may be successors in ownership to AWDI. This agreement can be extended if there is production on the property. Who and what is AWDI? To answer that question, we need to consider some related “deals.” AWDI was set up by Canadian billionaire, Maurice Strong, in order to make billions from selling the water underneath the Baca Grande ranch to the Denver area. Strong first became involved with the 132,000-acre Luis Maria Baca Ranch #4 in 1978 when he became director of the Arizona-Colorado Land and Cattle Company, AZL in 1978. This agribusiness conglomerate owned a series of other companies active in feed lots, land, oil and gas, engineering, a commodities trading house and a bank. And one of their properties was the Baca Grande Ranch. Interestingly, AZL invited Strong to be one of its Directors before he even owned any shares in the company. Over the next seven years AZL was traded back and forth by numerous international corporations. In 1985, Strong’s First Colorado Corporation purchased the Baca Grande ranch and in 1986 he created American Water Development, Inc. (AWDI) to pump and transport San Luis Valley water to the Denver area. It was Strong who severed the mineral rights from the surface rights on the Luis Maria Baca Ranch # 4. His AWDI scheme was defeated by a coalition of local citizens, ranchers and environmentalists in the late 1980’s, and the surface and mineral rights of the Baca Ranch have subsequently each changed hands several times. 5) Again, Lexam Explorations, Inc. purchased their interest in the mineral rights from Baca Minerals (Maurice Strong again?) and the Newhall Land and Farming Company in 1987. Canadian Rob McEwen, CEO of Goldcorp, purchased Goldcorp’s 49.8% share of Lexam in 2005 for $400,000 (Canadian), or 2 cents a share. The last quarterly financial statement shows that Lexam is now worth $12 million. When The Nature Conservancy acquired the Baca Ranch from Gary Boyce’s Fallaron Corporation in 1998, and again, when the U.S. government acquired the Baca Ranch from The Nature Conservancy several years later for about $34 million, it is reported that the mineral rights of the Baca Ranch could have been purchased for as little as $1 million. Why didn’t The Nature Conservancy or the U.S. government acquire the mineral rights along with the surface title when they could have been purchased them for only $1 million? Local Crestone/Baca citizens tried to find this out by accessing the pertinent sale documents through the Freedom of Information Act. However, we have not been allowed to view these documents. Hence, the question must be asked: Is there a secret government-corporate plan to control the mineral and/or water resources on the BNWR? UNTIL THESE ISSUES ARE RESOLVED IN A TRANSPARENT WAY, DRILLING MUST NOT GO FORWARD ON THE BNWR. Most of what is now the 92,000-acre BNWR was part of the 132,000-acre Maria Luis Baca #4 Ranch, which was one property of the agri-business conglomerate, Arizona-Colorado Land and Cattle Company, AZL. Again, Canadian billionaire Maurice Strong first was involved with the property in 1978 when AZL rolled out the red carpet for him so that he could help them solve their little problem, which was that the majority of shares were owned by Saudi sheik, billionaire, and arms, gold, and drugs dealer, Adnan Khashoggi. Khashoggi had purchased major shares of the Arizona-Colorado Land and Cattle Company in 1973. (Incidentally, Khashoggi’s career was started by the Bin Laden family, he had strong connections with British Intelligence and he was associated with the drugs/arms deals of the Iran-Contra scandal in the 1980’s*). (www.pehi.eu/organizations/introduction/PEHI_Maurice_F_Strong_bio.htm). Maurice Strongalso founded and headed the Canadian International Development Agency (CIDA), an agent of the British Crown, was first Director of the U.N. Energy Program, chaired Canada’s International Development Research Centre (INRC) and the Canada Development Investment Corporation. It is extremely noteworthy that Strong, as well as being one of the world’s wealthiest and most influential businessment, has also been one the most powerful men in the United Nations. He was its undersecretary-general of the U.N. and Secretary General of the Stockholm Conference on the Human Environment (Earth Summit I) in 1972 and the Rio Earth Summit II in Rio de Janeiro in 1992. He was the first director of the United Nations Environmental Programme (UNEP), and served on the U.N.’s World Commission on Environment and Development, as well as the U.N.-funded Commission on Global Governance. Strong also served on the Boards of International Union for the Conservation of Nature (IUCN), the Club of Rome, the World Resources Institute (WRI), and the World Wide Fund for Nature in Switzerland, the International Union for the Conservation of Nature and Natural Resources in Switzerland, and the Aspen Institute, all of which are international NGO’s that have developed and advanced the global, one-world government agenda since the early 1970’s. Strong, who was appointed by Canadian Prime Minister Brian Mulroney to the Privy Council of Canada, was also involved in a huge scheme, called the GRAND Canal, to divert water from Canada to the United States (www.discoveryvancouver.com/forum/topic.asp?TOPIC_ID=131262). According to author Glen Kealey, one of the main purposes of this planned water diversion was to create a giant Chicago-Winnipeg food cartel, which was to be managed from Strong’s Baca Ranch here. Although this plan was never realized, it also was never cancelled. According to Kealey, some version of it could surface again, as the present political and economic climate under NAFTA/Free Trade agreements make the project more viable. Strong recently cut his ties with the UN after being associated with various UN scandals and conflicts of interest, such as the oil-for-food program and his secret dealings with North Korea (www.foxnews.com/story0,2933,250789,00.html). And he is being sued by San Diego class-action shark Milberg Weiss for dumping his shares of Molten Metal Technology at around $31/share a month prior to the stock’s October, 1996 collapse (two years later they were worth 13 cents/share.). Due to Strong’s and Molten Metal’s ties with presidential candidate Al Gore, this issue has surfaced in Senate hearings on corrupt campaign financing (FORBES, Jan. 22, 1996 and Apr. 21, 1997). In 1988, Maurice Strong and his Danish wife, Hanne, created the Manitou Foundation in the Crestone/Baca community. Seed money for the Manitou Foundation came from Laurance Rockefeller ($100,000), Robert O. Anderson, Director of ARCO ($20,000), sale of Strong’s shares of AWDI ($1.2 million), and from a charity set up to support Strong’s (Rio Earth) Summit office ($21,500). Hanne likes to relate the story that in 1978, a mystic informed them that “the Baca would become the center for a new planetary order which would evolve from the economic collapse and environmental catastrophes that would sweep the world in the years to come.” Supposedly, this prediction inspired Hanne, through the Manitou Foundation, to donate substantial and beautiful tracts of land from their Baca Ranch to numerous spiritual groups from around the world. Land and buildings once owned by the Aspen Institute were donated to the Crestone Mountain Zen Center, run by Baker Roshi. According to the PEHI website, their website read: “In the mid 1990’s, Manitou and specialists of the Conservation Fund, with generous support of Laurance Rockefeller and the Jackson Hole Preserve, devoted several years to extensive studies of Manitou’s mountain properties, culminating in the creation of the Manitou Habitat Conservation Plan (MHCP).” Perhaps to help fulfill the mystic’s purported prediction of 1978(? ), Hanne Strong has developed plans for a Solar Eco-Village sited along the western border of the Baca Grande subdivision. Interestingly, this area is located within a mile and half of the Lexam’s proposed drilling. Thus, we see some very confusing, disturbing, and recurrent patterns here. Maurice Strong has consistently used his insider business connections to personally profit from international development projects which often are disguised as environmentally beneficial. Simultaneously, he has been able to shape the rules and terms of global environmental policies trough his influence in and behind-the-scenes control of the United Nations. Even a cursory look at his career reveals considerable corruption and conflicts of interest. As chairman and principle shareholder of Arizona-Colorado Land and Cattle Company, Strong was sued for allegedly hyping the stock ahead of a merger that eventually failed. As head of AWDI (American Water Development, Inc.), Strong made an unsuccessful bid to export the water from San Luis Valley aquifers to the Front Range. As Secretary-General of the 1992 UN Conference on “Environment and Development” in Rio de Janeiro, Strong helped draft and usher into completion “The Earth Charter” and “Agenda 21,” both of which were adopted at the 1992 Rio Summit. Though Agenda 21 purports to protect the environment, it is in reality a way to secure control of natural resources for the benefit of a small group of extremely rich individuals (http://www.freedom21santacruz.net/site/article.php?sis=443). Elaine Dewar, author of “Cloak of Green” (1995), states: “I was beginning to understand that the Rio (Earth) Summit was part of a Rockefeller-envisioned Global Governance Agenda that dated back before World War II.” In conclusion, even this cursory look at Maurice Strong’s career reveals that he is a central player in a global elite that includes the (multi-billionaire) Rothschild, Rockefeller, Bin Laden, and Bush families, has links to various intelligence agencies, and virtually controls the United Nations. Some of our Crestone/Baca locals have stated that Hanne has told them she believes Lexam is really after the water. Of course, it is hard to know for sure. But it may be inferred on the basis of his past record that Maurice Strong may retain an interest in the water and minerals of the San Luis Valley and may be in communication with Lexam CEO, Rob McEwen. 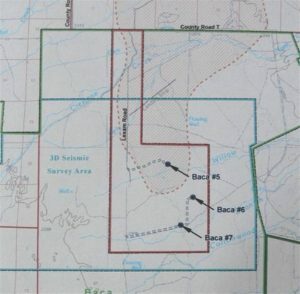 Lexam has now been granted permits from the Colorado Oil and Gas Conservation Commission (COGCC) to drill on The Baca National Wildlife Refuge in the deepest part of the San Luis Basin in an area that has never been drilled. And Lexam has now applied for an additional permit to drill an additional well (Well #7), which is located directly on the Spanish Creek/Cottonwood Creek wetlands. Figure 3. Location of Lexam’s proposed three exploratory wells on the BNWR. Figure 4. Location of proposed Lexam wells immediately next to streams/riparian zones. Lexam spent about $1.4 million to a conduct 3-D seismic survey in 2006 and plans to spend another approximately $10 million on drilling the three exploratory wells (slated for early 2008 or as soon as possible). It is important to note that whereas Lexam owns the subsurface mineral rights and the U.S. government (BNWR) owns the surface and some water rights, the state of Colorado owns most of the rights to the huge reservoir of groundwater in the confined aquifer. 1) Conventional geological wisdom until the early 1990’s (WWA page 3 of this website) was that the eastern part of the San Luis Basin (the Baca Graben) was underlain by about 4 km of Tertiary and Quaternary alluvial fill overlying Precambrian bedrock. Hence, it was then thought that there were no Mesozoic “source or reservoir rocks” in this area because regional uplift and folding and faulting during the Laramide Orogeny resulted in more erosion than deposition of sediments during the Mesozoic Era. 2) In 1992 and 1993, however, Challenger Gold drilled a number of exploratory wells and got “strong shows of oil” in 27 drillholes. Cretaceous Mancos Shale and Dakota Group and Jurassic Morrison Formation (Mesozoic) rocks were identified in outcrop and in 17 shallow drillholes. Mancos Shale is thought to be an excellent source rock and Dakota Sandstone is thought to be an excellent reservoir rock because it is sufficiently porous (15-21%) to hold commercial quantities of gas and oil. 3) In 1995, Lexam drilled the Baca #1 and Baca #2 wells and claims to have confirmed the presence of the Cretaceous section on the Deadman Creek block. The strongest shows of oil were in Baca #2 well at 6,620 feet in the Tertiary Sante Fe Formation, as well as in the Mancos Shale and in Precambrian gneiss. 4) In 1996, Lexam acquired 20 miles of seismic data and 221 gravity data points, which, they claim, strongly supported the presence of a thick Cretaceous to Jurassic section in the Baca Graben. Integrating this seismic data with previous seismic data, their consulting geologists delineated a large structural closure (the Crestone Prospect) at 7000 to 12,000 feet, with both trap types present. 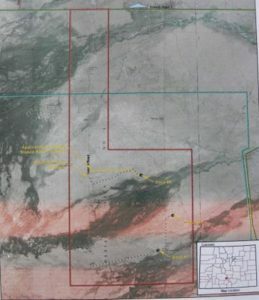 5) In 1998, SONAT acquired 31 miles of 2D seismic data over the Crestone Prospect which, Lexam claims, also confirms closure of Crestone structures. 6) In 1999, SONAT relinquished its option agreement on this seismic data with Lexam. 7) In 1999 – 2000, Lexam acquired and reinterpreted seismic line CF-8402 that suggested gas in Tertiary sediments above the Crestone Prospect. 8) In 2002-2004, Petro-Hunt acquired, processed and interpreted another 60 miles of 2D seismic data in 2004 and bought and reinterpreted another 50 miles of Chevron 2D seismic data. Petro-Hunt relinquished this option to Lexam in December, 2004. 9) In March 2005, Lexam purchased this seismic data for $419,000, which indicated that “closure” (i.e., a trap) is better defined for the Crestone East block than the Crestone West block. 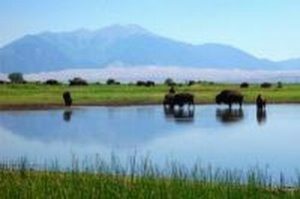 10) Today, Lexam’s primary targets are the Crestone East (4060 acres) and Crestone West (6,945 acres) prospects located in NW quadrant of “their property,” i.e., the Baca National Wildlife Refuge. 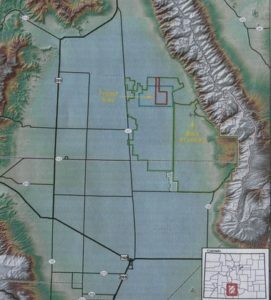 In addition, at Pole Creek (SE part of Baca Land Grant), a shallow 1.3-acre oil target is present in land overseen by the Great Sand Dunes National Park and Preserve. 12) Lexam is hoping that over 100 and up to 550 square miles of the Crestone sub-basin contains a 2000 to 3000 ft. thick package of Cretaceous rocks at depths of 7000 to 17,000 feet. Physical exploration for natural gas involves drilling of “wildcat wells” to determine both the location and size of potential deposits. Upon discovery of an economically viable field, a “full field development” plan is implemented with spacing of wells and other production concerns set out in a variety of corporate, local, state and federal proceedings. Spacing of gas wells in some parts of Colorado as close as one well for each 10 acress. The gas field is then developed site-by-site with the drilling of production wells. Pipelines, treatment facilities, compression stations, and a variety of other production infrastructure facilities are constructed at the well site to extract the raw oil and gas, separate the saleable materials, prepare for transporting the oil and gas to market, and dispose of wastes and by-products. Gathering pipelines lead to centralized field facilities for further treatment, compression and waste disposal. From there, transportation pipelines are used to ship oil and gas products. The field is operated for decades with daily maintenance checks and frequent construction work required to keep these industrial facilities operating. Production data is constantly gathered during the full field development and can lead to changes in well-spacing and operations requirements. However, little data is gathered on the environmental impacts of production, treatment and transportation. Eventually, gas sources are drained and fall below profitable flow levels. The wells are then “abandoned.” The abandonment phase includes plugging wells, removing infrastructure, and, in theory, returning the land back to the condition that existed before full field development. Since each of these phases can have detrimental impacts on the surrounding environment, the ability to return the land and water to the condition before full field development is still a theory that has not been proven on the ground. “Plugging and abandonment” is an industry term that refers to the stage at which a well becomes uneconomic to operate and is therefore abandoned. Once production ends, the well is capped. This involves placing cement plugs into the wellbore and at the surface. Abandoned wells are the source of numerous water well contaminations. Instead of properly plugging and abandoning wells, many companies just walk away from uneconomic wells by selling them to undercapitalized corporations near the end of the profitable stages of the life-cycle of the well. These are termed “orphan wells” and become the responsibility of the federal agency and ultimately that of the taxpayer. In a survey completed by the BLM in 2001, it was reported that dozens of orphaned wells have been left behind on Western public lands, leaving everyday taxpayers on the hook to clean up industry’s mess. Current bonding requirements are inadequate to ensure that orphaned wells are properly plugged and abandoned.